This article contains in depth information about E-commerce market of UAE and various other ecommerce business aspects like, ecommerce website builders, most popular ecommerce websites in UAE and most trending products purchased online. Please use the table of contents if you want to jump right in to the sections describing the content you are looking. Based on the latest ecommerce numbers, the internet penetration in the UAE stands at 99%. So when we talk about the ecommerce figures as a percentage of the internet users in the country, we are taking into account nearly the entire population of the country. Out of this total number of internet users in the UAE, at least 85 percent have searched for a product online and 91% have visited an online retail store over the past 30 days. At least 63% have actually made a purchase online. Both mobile and desktop users contribute equally towards the total number of purchases. 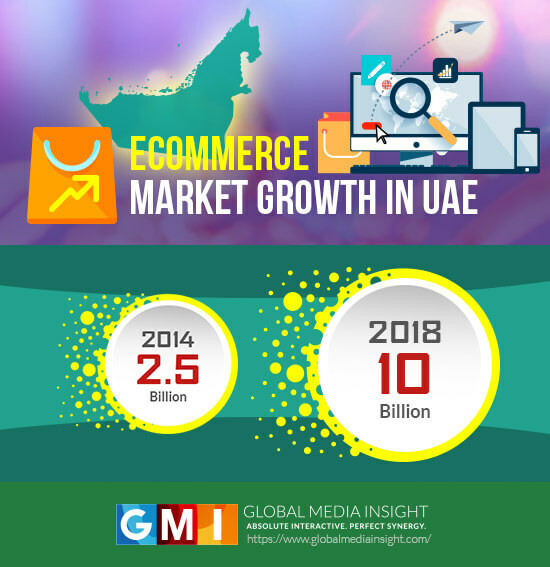 Ecommerce market in UAE have witnessed a substantial increase during the period 2014 to 2018. In fact, from just $2.5 billion in 2014, the ecommerce market in the UAE is projected to reach $10 billion in 2018. WHAT DRIVES UAE’S ECOMMERCE MARKET GROWTH? The UAE has shown incredible acceptance towards mobile devices and the internet in general. In fact, the country is number one in terms of global smartphone penetration. This proliferation of mobile and internet technology has been a major contributing factor towards the growth of ecommerce in the country. There are very few countries in the world that are as encouraging of entrepreneurship and startups as the UAE. The country’s many business friendly policies, designed by a very progressive government, offer a fertile environment for new and young ecommerce businesses to flourish and grow. Additionally, the country has been successful in attracting quality talent and labour from around the world at globally competitive rates. Businesses in the UAE are supported by a host of efficient and modern infrastructural and technical implementations that facilitate trade, transactions and deliveries. The advanced logistics, connectivity and trading establishments are the foundations upon which the modern technology driven enterprises have found their incredible growth. 2017 was a big year for ecommerce in the UAE. Amazon bought Souq.com, the biggest ecommerce brand in the country and Emaar Properties launched Noon, an all-new $1 billion ecommerce venture. In addition to these, a slew of other FDIs and startups in the ecommerce have also contributed significantly to the growth of ecommerce in the country. Thanks to the variety of ecommerce platforms now available in the market, it is easy for everyone from established businesses to startups to set up an ecommerce website and start selling. Each of these platforms has its own strengths. While some offer drag-and-drop editing and can be maintained with zero technical knowledge, others are more code-intensive and feature-rich, and offer higher degree of customization. Below we take a look at the most popular ecommerce platforms in the UAE. WooCommerce is the most used ecommerce solution in the world, it is a powerful, open-source e-commerce plugin built for the WordPress CMS. If you’ve spent some time using WordPress, working on WooCommerce should come naturally to you. While the basic plugins are free, you might need to buy premium extensions if you need added features. And if you need even further customization, you can get paid extensions to do that for you. WooCommerce is Free (but some extensions and customization are chargeable). Magento has a very huge database of themes and it is one of the popular ecommerce website development platform. Magento’s backend uses fairly advanced programming and hence it is going to be almost impossible to use if you have no prior experience in web development. You might need a magento developer to customize and develop your ecommerce website using magento. Magento has 2 editions. The Community edition is free, and you can download it from Magento’s main website and install it on your server. The Enterprise edition has a subscription plan that ranges from $22,000 to $75,000 yearly, based on your store’s total revenue. The back-end provides all the code editing tools you need. There are wishlist, discount and up-sell functionalities to market your product. Lots of apps from third-party developers. Primarily used by SMEs, MonsterCommerce is a feature-rich and user friendly option with a lot of in-built tools and SEO-friendly capabilities. MonsterCommerce’s customizable storefronts are easy to manage and can be scaled for a variety of different product volumes and varieties. MonsterCommerce was acquired by Network Solutions in January 2006, and it is now available at networksolutions.com. The Starter Plan is available at $9.95/month. OpenCart is an easy to use and easy to develop platform that’s based on PHP and MySQL. The free to use platform offers multi-language and multi-currency support. One of its best features is the multi store support, wherein you can manage multiple stores through a single admin panel. customize, and even someone with little to zero web development knowledge can setup a Shopify store. Shopify offers flexible monthly subscription plans at $9, $29, $79 and $299. WixStores is one of the easiest to build ecommerce solutions in this list. Storefronts on WixStores are built using HTML5 templates and can be managed with little to zero programming knowledge. Based on a freemium model, WixStores is a cost-effective cloud-based ecommerce solution that is remarkably fast and secure. pages, bandwidth and email marketing options. Best for creating simple online stores using drag and drop feature. Allows monthly payment, where most other ecommerce platforms only allows yearly payment. Attractive ecommerce website design templates. PrestaShop is an open source e-commerce solution with lots of capabilities and built-in functionalities. It is a great choice of platform for new businesses starting off with low capital. Though the platform is open source, it is very user friendly and can be used by even those with little technical skills. There is a highly active and responsive community of users where you can find help with development and maintenance. Easy installation and fast deployment of online store. Virtuemart is another open source ecommerce solution. Built as an extension for the Joomla CMS, it is compatible with many other extensions on the platform. Virtuemart offers statistics tools to help with easy analysis of sales numbers to support your marketing efforts. One of Virtuemart’s biggest advantage is its support for multi-category and multi-feature products. This can be really beneficial for brands with huge portfolios. As per latest figures there are nearly 135 ecommerce websites operating in the UAE. Even with this variety, the UAE ecommerce market seems to be polarized with one player drawing in most of the sales. Souq.com is right at top with nearly 37 million monthly visitors (as per January 2016 figures). Souq.com is also the 9th most visited website in the UAE. The distant second in the list is Awok.com with 2.4 million visitors . Wadi.com, Namshi.com and Landmark Shops take up the 3rd, 4th and 5th positions respectively. Similar to global trends, electronics and software seem to be the most popular types of products being purchased online in the UAE. They account for a massive 69% of the total online purchases in the country. This is followed by clothing and accessories at 17% and 14% respectively. What we can derive from these figures is that the UAE has not yet begun experimenting with online purchases and it has a primarily young online shopping audience. The growth of ecommerce in the UAE is part of a series of larger changes shaping the country and the region as a whole. In spite of this, when compared to other countries, ecommerce purchases in the UAE contribute the least percentage towards overall GDP. This means that there is still a lot of untapped potential for ecommerce in the UAE. If you are a business looking to set up a new digital storefront or trying to improve your existing ecommerce website, we can help you out. With over 16 years of experience in digital technologies, web development and design, GMI’s teams of experts can help you identify the perfect platform for your needs, and also build you that perfect ecommerce website you need to attract customers and drive sales. Get in touch with us today.